Forget dishes – its a grill night! Posted in What's Amy Eating? | Comments Off on What’s Amy eating? Fermented foods are getting lots of attention these days. Research has suggested that there are benefits to consuming the happy bacteria in fermented foods, including probiotics. The bacteria appear to improve digestion, boost immunity, and possibly even help with weight management. Exactly how remains unclear and how much be eaten in order to reap these potential benefits. Regardless, it may be worth incorporating a few fermented foods into your diet, such as tempeh, miso, sauerkraut, kefir, yogurt, kombucha, and kimchi. Pickled fruits and vegetables provide probiotic benefits as well but only in foods pickled in brine, not vinegar, and in unpasteurized pickled products. Boil the salt, water, bay leaves, black peppercorn, and chile for a minute or so. Then, turn off the heat and let this cool to room temperature. 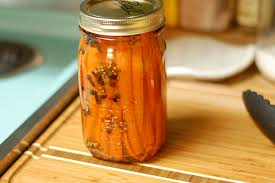 Once the brine has cooled to room temperature, pack the carrots and the thyme sprig into a clean Mason jar and pour the brine over them, making sure the jars all get some of the spices. Pour leftover brine into a plastic bag and tie off. Push the bag into the jar of carrots to ensure that the carrots are completely submerged in the brine. If the carrots come in contact with air, the carrots will spoil with mold. Put the jar into a cool, dark place for at least 3-4 days but typically not longer than 2 weeks. The temperature should be about 55-70oF. The longer carrots ferment, the saltier and tangier they will taste. Remove the bag of leftover brine from the jar. Screw a lid onto the jar and place in refrigerator where they will keep for about 6 months. Man, I love the game of tag. And I’m not talking about tagging myself in Facebook photos. I’m talking about that classic game that involves one or more players chasing other players in an attempt to “tag” or touch them with their hands. Once tagged, that player is now “It” and responsible for chasing someone else down to tag. Growing up without playing tag is, to me, like going to Paris and not seeing the Eiffel Tower – simply sacrilegious. While traditionally thought of as a playground game for children, there are so many benefits to this simple game that it’s a great way for the entire family to get moving. Requiring no equipment, no teams, and no score keeping, tag can be played quickly and almost anywhere without preparation. The start and stop motion of the game also results in tremendous aerobic benefits and improvements in speed, agility, and endurance. The fast pace of the game can be tiring in just 15-20 minutes. And, the fun of the game satisfies even those who dread the chore of just running. Categories. The “It” chooses a category. Players can avoid being tagged by sitting down on the ground and shouting an item that fits in that category just before being tagged. For example, if the category was “fruit”, a player would avoid a tag by sitting on the ground and saying “apples”. Players are safe as long as they are on the ground but they can only sit on the ground for 10 seconds and can only shout a category and sit on the ground when “It” is 10 feet away or closer. 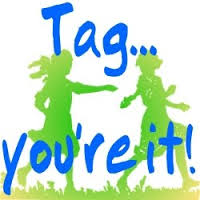 Freeze Tag Just like regular tag except that when someone is tagged, they are frozen and can’t move. There are many variations as how to get unfrozen – getting tagged by another player that isn’t “It”, having someone crawl between their legs, etc. Once someone has become frozen three times, he or she becomes the new “It”. Bumper Tag Just like regular tag except that instead of tagging with hand, the “It” must tag with his or her hips. Remind players that all that is needed is a little bump. Nobody should be purposefully knocked to the ground. Blob Tag Requires multiple people. When tagged, the player joins hands with “It” to create a large blob. Once the blob has 4 people, it can split into groups of two only and may split into groups of two any time thereafter. The person left without being tagged is “It” and the game starts again. Fainting Goat Tag In this version, the “It” is called the Shepard. Whoever the Shepard touches becomes the new Shepard. The other players are “goats” and they can fall to the ground to avoid being tagged but they are only safe on the group for up to 10 seconds. The goat can only fall to the ground when the Shepard is 10 feet away or closer. Dead Ant Tag Requires at least 6 players. In this version, once tagged, the player must lay down with both hands and feet sticking straight up, like a dead ant. In order for the dead player to come alive, four people must tag one limb each. Once a person has been a dead ant three times, he or she is now “It”. Shadow Tag Instead of tagging the person, “It” tags someone by stepping on the shadow of other players. When a person’s shadow is stepped on, they are frozen until another player steps on their shadow. Hug Tag Just like regular tag except that players can be safe from being tagged if they are hugging someone else. They can only remain in a hugged position for 5 seconds. Werewolf Tag One player is selected to hide. The other players search for the player. When one of the players finds the hiding player, they scream out “WEREWOLF!” The werewolf comes out of hiding and chases after all the other players. If caught, that person becomes a werewolf as well. The last person not tagged becomes the werewolf for the next round. Summer has arrived in Vermont out of nowhere, making tonight an official grill night. I picked up some great grass-fed meat from the farmer down the street – the nutrient composition is far improved in grass-fed or wild caught animals. Seis de Mayo! Last night was taco night in honor of Cinco de Mayo. I always try to make extras on taco night to have enough leftovers for another meal or at least a variation using some leftovers if not enough for a complete meal. Save time where you can because there never are enough hours in the day. Tilapia is a pretty light and versatile fish, relatively inexpensive, and a good protein source. Over the past few years, it has risen the popularity charts among American diners; however, nutritionally, it is really not the best choice among our scaley friends due to its ratio of omega-3 fatty acids to omega-6 fatty acids. While both of these fatty acids are needed by the body, research suggests that we need more omega-3 fats, which are anti-inflammatory, than omega-6 fats which may exacerbate inflammation. Farmed tilapia has even more omega-6 fatty acids than wild caught. In the end, my recommendation is to eat a variety of fish to reduce contamination and to prevent getting just the same fatty acid profile from your fish. And always, wild caught trumps farmed fish. Family that jogs together, lives longer together. 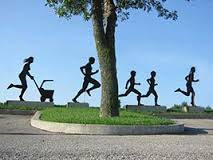 Try this idea to get the whole family moving – create a family jogging club. Keep members motivated by creating a card for each child that can be used to track the number of loops they complete on a designated loop course. use card stock and let the kids decorate their own card (added bonus – arts and crafts project! Glue, glitter, and stickers can entice many a munchkin). Give a hole punch for every lap completed. Once a member’s card is full, give a small prize or reward. *Keep in mind that prizes don’t have to cost money. Kids can be very motivated by cost-free prizes such as choosing the dinner menu, getting an extra book from the library, or having a sleepover. Posted in Nutrition for Parents | Comments Off on Family that jogs together, lives longer together.